The event was the result of about 3 months of organizing in Watts, during which time the remarkable Mike Chattom, known locally as "Big Mike," escorted me into numerous situations in Watts I never would have gotten into without him. I attended numerous church services, prayer meetings and Bible study classes where I was lovingly received and allowed to briefly present about the event. We were enthusiastically supported by the Watts Neighborhood Council, and engaged with the Watts Gang TaskForce and Much 62, an organization focussed on mass incarceration. 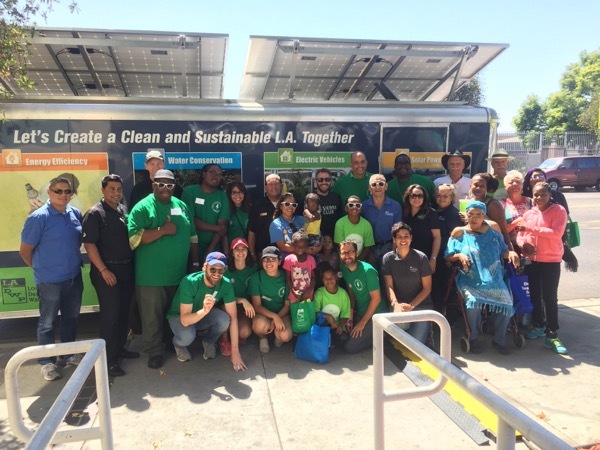 We were given enormous support by Councilman Joe Buscaino's office and by the LA Department of Water & Power, who used the event to announce 6 new car chargers scheduled for installation in the community in the next 2 months. Crucial participation came from Downey Nissan and Anaheim Pre-Owned Cars. Neighborhood youth showed high interest. The Watts Electric Drive & Ride Event will feature an array of electric battery powered vehicles, some displayed by owners and others by local car dealerships. The event will emphasize the economic advantages of electric driving by including presentations about rebates and incentives by the Clean Vehicle Rebate Program, the South Coast AQMD's Replace Your Ride Program and LADWP Charge Up LA program. Registered attendees report 300,475 electric miles driven.